I enjoy doing maths and I spend a lot of time working on it, but I have a hard time calling myself a mathematician. It’s not because I dislike the label – on the contrary, I don’t feel as though I’m really worth of the title. Real mathematicians… well, they’re the kind of people who go to the National Mathematics Summer School (NMSS, affectionately pronounced as Nemesis). 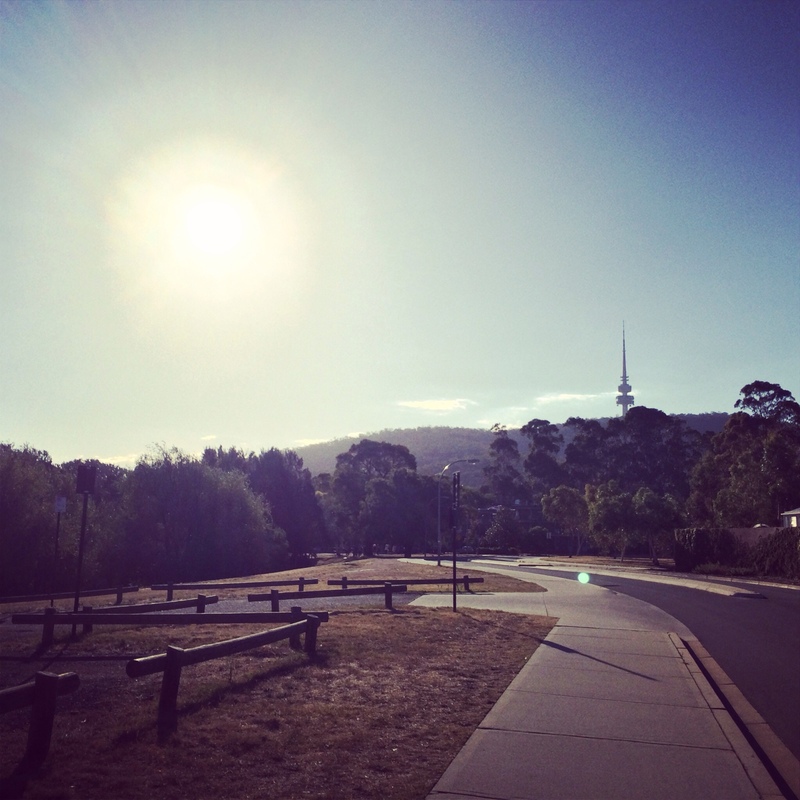 Some of the view during my walk from the bus stop to the part of the ANU campus where I stayed. Perhaps you think you know some nerds. Do they chuckle with childish delight when considering the cyclical nature of inverses that exist in the set of Gaussian integers modulo the complex number (4 + i)? No? Then step aside and let the real nerds take the stage. These guys – and hence by extension, their tutors and lecturers (who are mostly NMSS alumni) – are the real deal. I would never have attended NMSS as a student. I didn’t have anywhere near the mathematical chops to even be considered as a candidate (there are roughly 70 positions for the entirety of Australia). But I may well have enjoyed it if I had been invited. Since it’s a gathering of students from across the country, they try to assume very little prior knowledge – hence their focus on number theory, which is renowned as easily accessible and abundance of opportunities to “think deeply about simple things”, the motto of NMSS’s recently retired director. But this week, I wasn’t there as a student – I was there as a teacher, to get a concentrated version of what the students were experiencing and then to think about how that would inform our practice as educators (particularly with regard to nurturing and encouraging gifted and talented mathematicians). It was a jam-packed couple of days and I found myself constantly thinking of new and awesome ideas that I would love to start implementing when I get back to the real world, but unfortunately I think I’ve just about maxed out (or exceeded) the number of new things I’ll be doing this year. So mostly I think I was mentally filing things away for the future, waiting for a time when I can act on them and give them the time and effort they deserve. One thing that remains deeply impressed on my mind, though, is the importance of teaching mathematics in an engaging way (and, related to that, encouraging people who are capable of that into the profession rather than ushering them off into engineering or actuarial studies). Being exposed to so many passionate maths teachers (and I use that term broadly of anyone who teaches mathematics, not just people who work in high schools) was a vivid reminder of how important the delivery method is in shaping a students’ experience of a subject. If someone teaches you how to cook by forcing you through lessons and explaining things in a bland way (see what I did there? ), then who can blame you for disliking the kitchen? But if someone visibly enjoys the process of mashing food together in an awful mess, if they express genuine delight at the intriguing ways that foods can relate and be combined with one another, if they marvel with closed eyes at the smell of what they have just concocted, then who can help but feel inspired to try and master the same subject that brings so much joy? And I think that is a part of why Jamie Oliver rose to fame so rapidly (and subsequently kept it). I hate cooking, I hate the lengthy preparation, I hate the mess, and I hate the low-quality stuff that I usually produce. But when I watch Jamie Oliver at work, I want to get up and cook. I want to give it a go and learn how he does what he does. And that’s exactly the same vibe that the NMSS tutors and lecturers give off to the students who are privileged enough to attend. Wouldn’t it be fantastic if ordinary students could experience some of that during their normal schooling? It shouldn’t just be for the elites. I’m under no illusion that the whole NMSS experience can be replicated on a large scale for the entirety of a school year, but the world deserves to know that mathematics is a fascinating and amazing subject – not the dry, boring thing that most people think maths is. And we’ll need passionate mathematicians and educators to accomplish that. Now there’s a long term goal worth working on! This entry was posted in Mathematics and tagged Blog, featured. Aside from raving about the superiority of the ACT secondary schooling system (something I’m totally willing to admit – sorry NSW, I love you but I hate you too), Betty shared with me her passion for positive psychology. (For the uninformed, to give you a brief and over-simplified summary, it’s an approach toward people’s mental wellbeing that focuses on their strengths rather than on what’s wrong with them.) I found it both intriguing and refreshing, for a few different reasons. Firstly, though the idea of positive psychology seems to be gaining currency, the practice of positive psychology in the schools that I’m familiar with is lacking to say the least. When Betty told me a few things about how positive principles were a part of her classroom practice, the kinds of structures that some schools in Canberra have in place to implement it and the kind of helpful effect it was having on her students, I was just blown away. This is something that we definitely need to learn from. Secondly, it dawned on me just how relevant it was for all teachers – but particularly mathematics teachers, since that’s what’s going through my head at NMSS – to be caring for the psychological needs of our students in a positive and nurturing way. Mathematics has a just reputation as possibly the most demoralising high school subject in existence, with a massive (usually damaging) psychological effect on thousands of students every year. I’m convinced that this is part of the reason why so many students are convinced that they are bad at maths: regardless of their actual mathematical ability, they have had a series of bad experiences with studying maths that have left them psychologically scarred and they have (understandably) just given up on ever understanding it. This is a great tragedy and something that drastically needs to be changed. Thirdly, Betty’s smile and enthusiasm are pretty infectious. That’s not a very professional assessment of the facts but it’s true! So as I continue to think about the new role I’m starting this year, I’m now faced with this question: amid all the organisational decisions, the results analysis, the academic rigour and everything else that a head teacher is supposed to be prioritising – how will I care for my students’ wellbeing? What principles will I bring to the way I interact with students and lead my faculty to ensure that we develop their strengths rather than become fixated on their weaknesses? For that matter – how will you be caring for your students’ wellbeing? Now there’s a question worth considering as January 28 approaches! Teaching myth #1: teachers are lazy because they get massive holidays (at least, compared to the 4 weeks of annual leave that most workers in Australia get). This myth is perpetuated because it’s half-true (yes, we do get a relatively large amount of leave – roughly 11 weeks of breaks between school terms), but it’s not true. Teachers who are idle during their school holidays are the exception, not the rule. Case in point: here I am in the middle of summer, setting up my new workspace during the holidays. 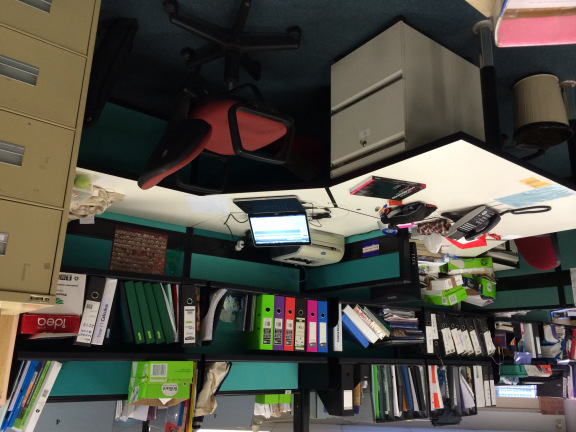 Okay, I’ll admit that (especially given the new step-up in responsibility involved in my new role) it would have been plain foolish to not come in during the holidays to bring in all my resources and arrange my desk before the school term begins officially. Here’s how it looks at the moment. It’s pretty bare right now, but that’s because term hasn’t begun yet. Just wait… the chaos is coming. The staffroom I’m working in is quite different to the one at my previous school. It’s a combined staffroom, housing 4 faculties (Science, Technology, Creative & Performing Arts, Mathematics) and 67 staff. It’s not the first time I’ve experienced this kind of arrangement – Fort Street High School (where I did a practicum and subsequently had my first full-time job) also has combined staffrooms – but the scale of this one is still something to behold. Click the photo above for a bigger version. This image is a pair of panoramas combined together, but the stitching in the middle isn’t perfect. It’s still good enough to get a sense of the working environment, though. New… year, school, role, blog! I have always loved to write. Since a young age, I have always owned little notebooks where I scrawled down thoughts and ideas. During high school, I always enjoyed creative writing and subjected myself to the vagueness of English Extension 1 (to me, anyway) so that I could enrol in English Extension 2 and create a major work. It was at uni that I discovered the joy of writing for its own sake – writing because I wanted to, not because I had to in connection with some external assessment or other requirement. Writing because it was a useful way to form, develop and retain thoughts. I started a blog, made methodical notes on anything I wanted to really learn, and engaged in all kinds of other writing to keep my brain going. In the last 15 years, I’ve created and killed countless writing projects. It’s been a while since I started a new one – so, why a new blog in 2014? It’s a paradox, really. This year, I’ll be undergoing the biggest professional change since I started full-time work. I’ll be in a new role at a new school and the learning curve will be very steep, particularly in the first 12-18 months. That makes it both the best and worst time to start a writing project like this. It’s the worst time because I’ll have the least time to commit to it; it’s the best time because a time like this, when I am going to be going through a lot of new experiences and forming new working principles, is precisely when writing is most beneficial. So here goes nothing. Let’s see how long it lasts. I hope to learn lots as I write here – and maybe even you will too.